Hello beautiful friends! 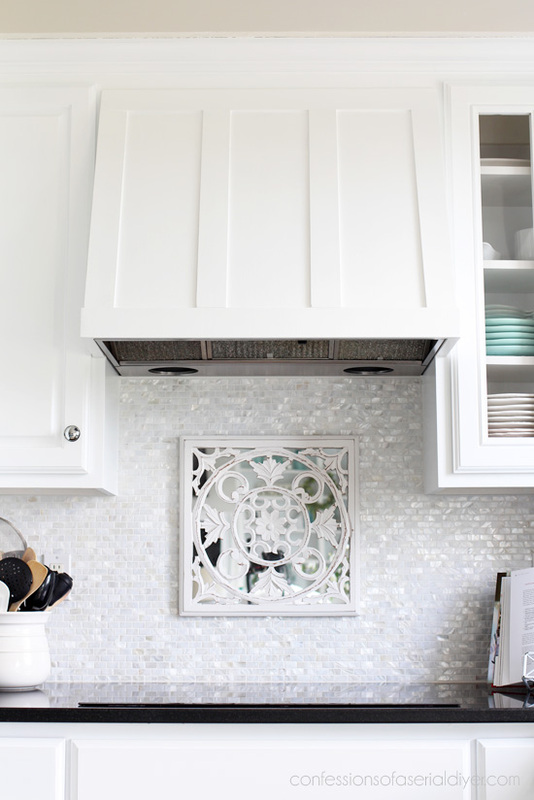 Today I’m sharing how I tiled the backsplash in our kitchen. I was searching for options on Amazon and found this one HERE. Because it is genuine mother-of-pearl, it is very thin. (Strong, but thin.) I did a few things differently than I might have if the tiles were regular thickness. 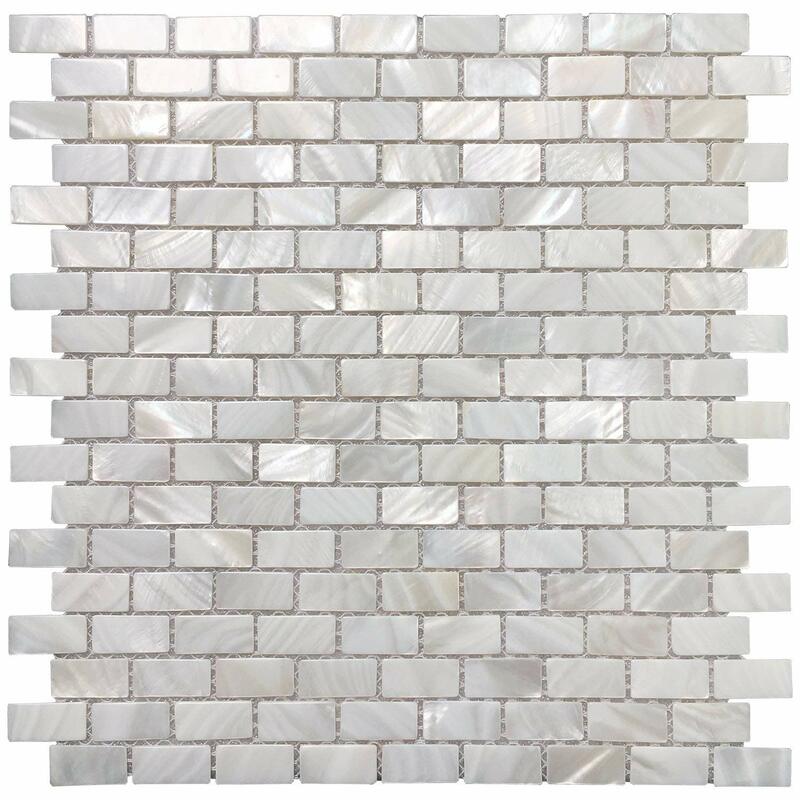 Now you could absolutely adhere this tile right to your existing wall if it is in great condition. 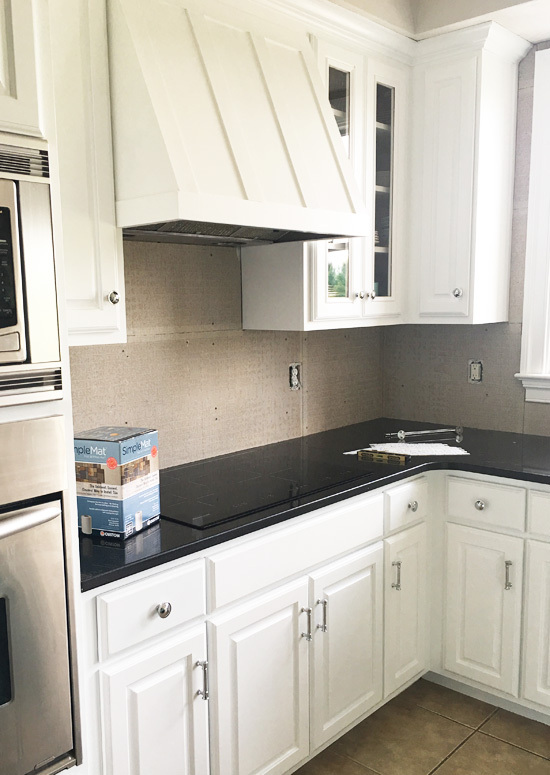 However, after removing the 4″ granite backsplash we had originally, there was a small gap between the counter and the wall, and hanging the tile right on the wall would have left too big of a gap to caulk in my opinion. I opted to add a layer of 1/4″ thick HardieBacker cement board to the walls to bring it out enough to cover that gap. It is sold in 3′ x 5′ sheets at the Home Depot. The added bonus of adding the cement board is that it is designed to be mold resistant, which definitely doesn’t hurt. 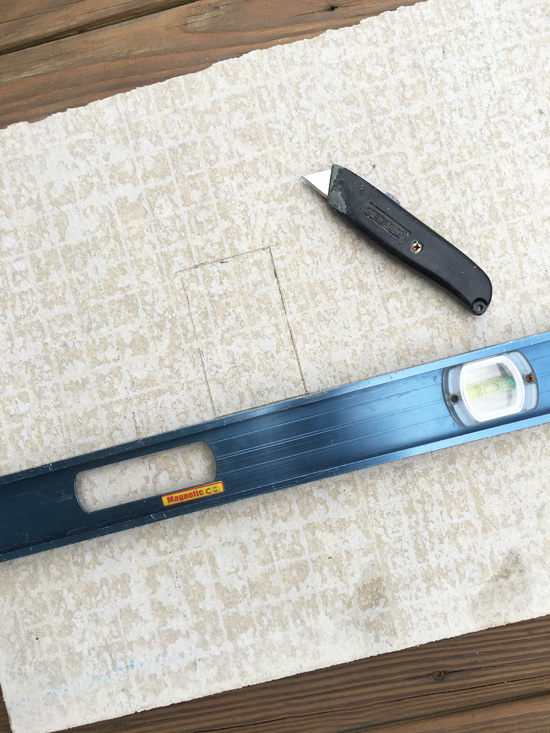 To find the studs, you can use a stud finder, or look at the underside of your cabinets to see where the cabinets have been screwed into the wall. That should be a stud. Then measure 16″ from that point and you should find another stud and so on. Since the screws wouldn’t lay flat enough if I used them where there was not a stud, I opted to secure the cement board in those areas using my nailgun. I taped the seams with fiberglass tape. It also calls for mudding those seams with mortar, but since I wasn’t planning to use mortar to attach my tile, I skipped that step. If you’re lucky, you can skip right to this step! This was pretty easy to use and saved a lot of mess! It is adhesive on both sides and basically you stick it to the wall, peel off the backing, and stick your tiles on it. It comes in a roll or in small sheets. I used a little of both. The roll made it really easy to hang these long pieces. I continued butting the pieces together until all the walls were covered. These worked great. You could probably install this tile using only these if you needed to, as long as you wear gloves to protect your hands. If a piece is cut wonky, just pull it off the mesh and replace it with a better piece. 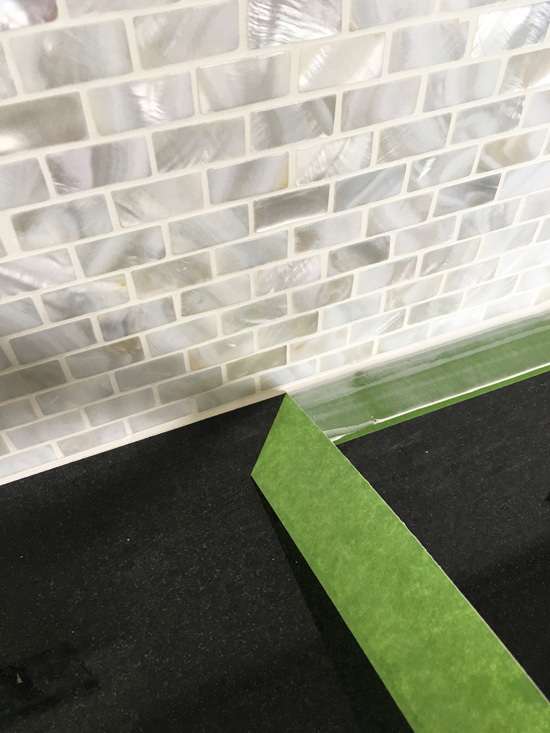 There is no need to let it cure like there is with mortar, but I did find that the longer the tile was attached to the Simple Mat adhesive, the harder it was to pull off, so I let it sit overnight. I used non-sanded grout for this tile as sanded grout would scratch my beautiful tile. 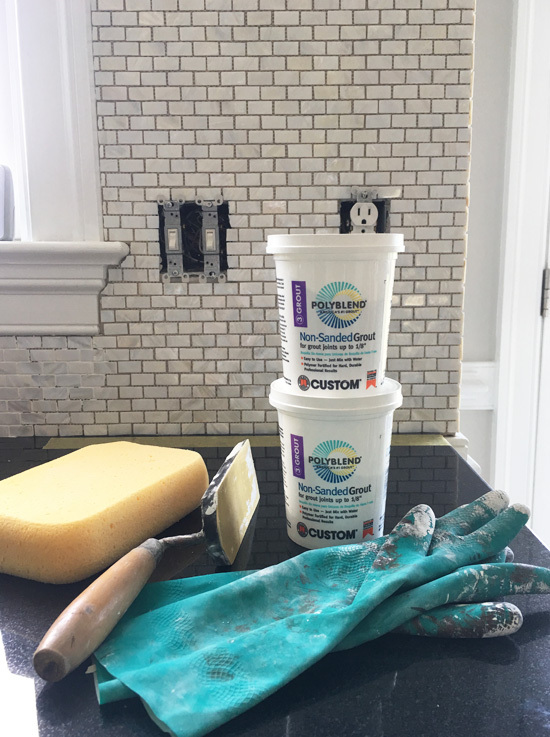 (Non-sanded grout can be used in joints under 1/8″.) It is available in a 10 lb bag or these 1 lb tubs. The 10 lb bag is cheaper, but I found these small tubs very manageable to work with. I used four of them I believe. It is suggested not to apply more grout than can be cleaned within 30 minutes of firming. I let each section set up for about 10 minutes or so before going back over it with my damp sponge. Use as little water as possible as too much water can weaken the joints. Again, follow the instructions on the grout label. Let it sit for three hours and then use cheesecloth to remove any haze. 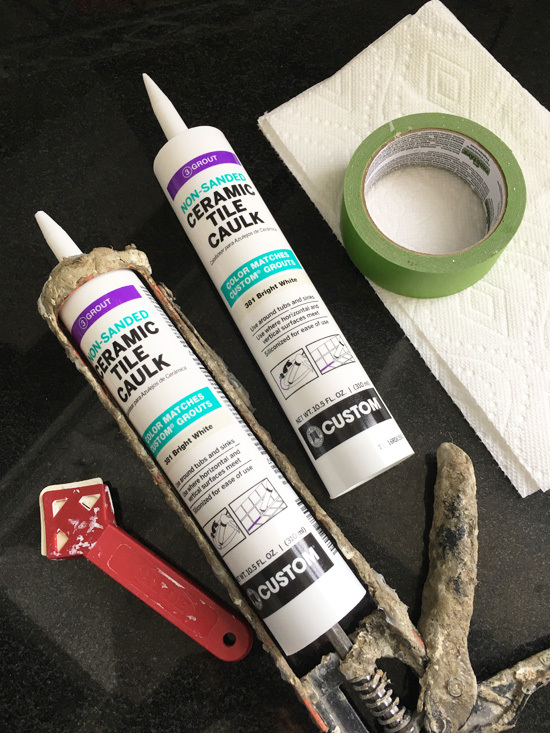 The same company that makes the grout I used also makes a tile caulk to in colors to match. 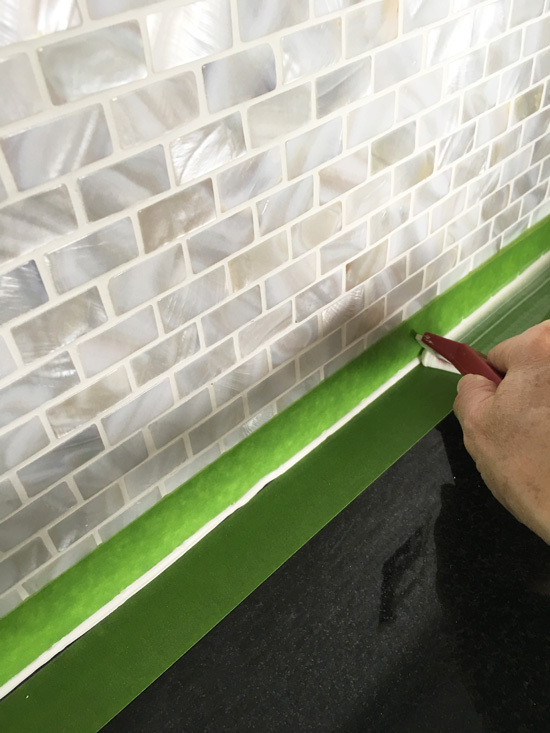 For the seams where the tile meets the walls and where the tile meets the counters I chose to use the caulk. It is less susceptible to cracking in those areas. TIP: To stop the caulk from continuing to ooze out after you release the trigger, pull the release as if you were going to remove the caulk from the gun. It will release the pressure and stop the oozing right away. 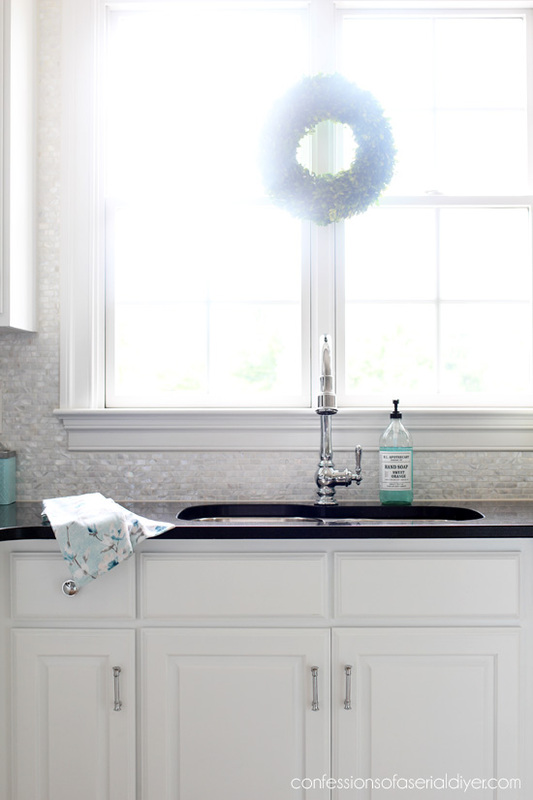 This was especially important since my grout is bright white and our counters are black. This would be a real mess had I not taped it off first. The final step is to seal the grout, which I have not done yet. For now I am enjoying our beautiful new backsplash! 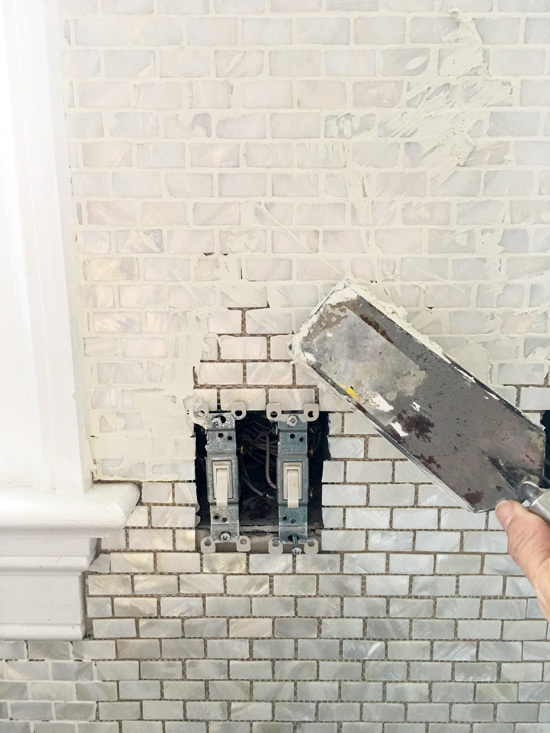 I have done a few tiling projects in the past and this tile was pretty easy to work with in comparison. If a piece didn’t cut right, I could just pull it off and replace it. Very user friendly! New Pendant Lights and we have Glass! UPDATE: Check out what big project we’ve taken on this time HERE! Wow that looks easy when you show all the steps. It is certainly beautiful. I am looking forward to seeing your next home project. It all looking so amazing! WOW, Looks stunning. What a beautiful kitchen makeover. I am absolutely gaga for this tile backsplash. Your kitchen, and the renovation that created it, is at the top of my favorite’s list. I’m so impressed with what you’ve done. Now if I could just make myself realize that I can do it, too. First off – OMG gorgeous! Thanks so much for sharing such detailed instructions! How did you do backer board in the area around the shelves? Did you remove them or piece it in around them? And how is the board not visible in the photo showing the tile in the shelf area (the last photo in the instructions before the overall photos)? And, finally, where did you get that hand soap bottle? It’s exactly what I’ve been looking for! 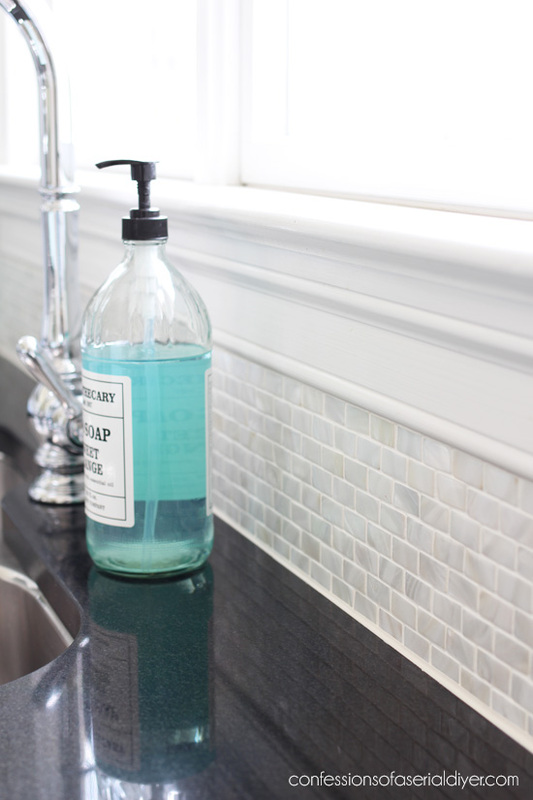 I don’t need the blue soap, altho it’s a beautiful detail in your kitchen, just the bottle. Thanks! I’m so glad I found your blog! Ohhh I see it now! Sorry my question wasn’t clear – I was typing on my phone and left out some of my question. I totally didn’t notice it the first time that the tile “wraps” around the backer board Great idea! And yum, love orange scented soap. Honestly, I thought you bought clear soap and colored it because it matches your other blues so well lol. I guess that wouldn’t make sense, though, since it would then stain people’s hands – duh. Thanks for answering! I absolutely love your kitchen. It turned out beautiful! 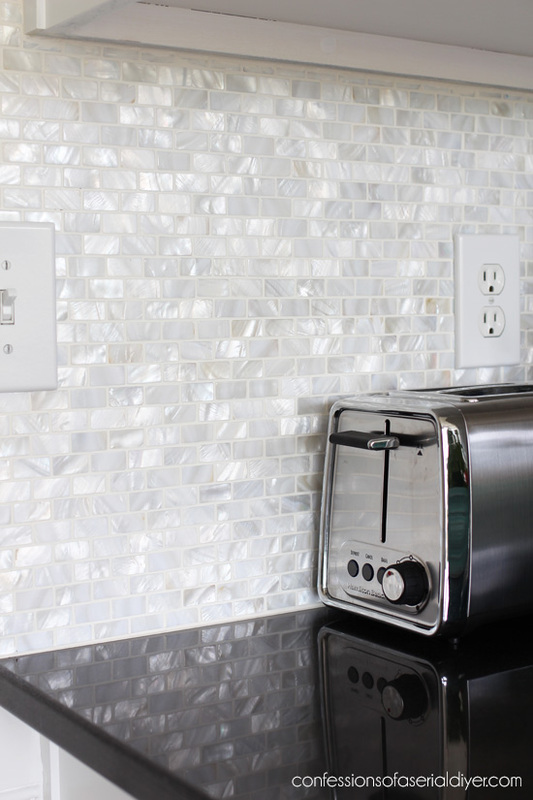 Wow…your new backsplash is just beautiful! Thank you for sharing the detailed instructions and product sources, Christy. I am very impressed with the results of your kitchen makeover!! Awesome tutorial Christy with great tips! 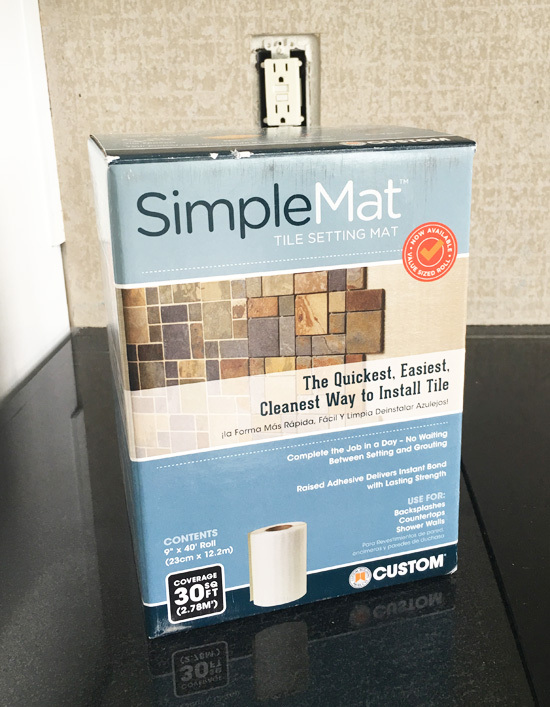 I am not familiar with Simple Mat but it looks like it was easy to use and is a real time-saver! Thanks for sharing and I love your blog! Keep up the great work! Stunning, love the mother of pearl. Thanks so much for the mini tutorial. How is the Simple Mat working out? I’ve read mixed reviews but have had mastic fail too which is far more disastrous since it ruins the tile. It’s great to know there may be a viable alternative. Christy, It’s good to hear how well it’s holding up. I’ve been considering installing a similar backsplash in my kitchen but have been very intimidated. This seems far easier than mastic and with far better results. That kitchen is just magnificent, Christy! Yes, I do believe you’re already onto another project and I can’t wait to see what it is. 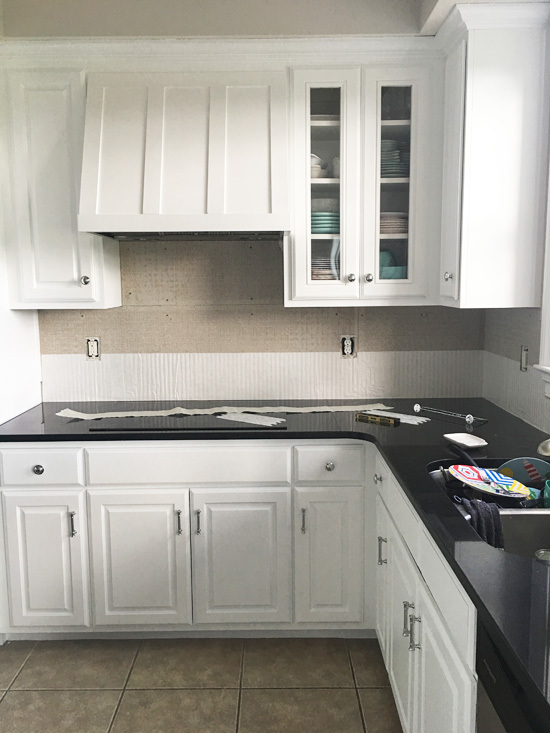 what a wonderful choice choosing Mother of Pearl – it looks spectacular against your black countertops! the one thing I plan on doing (WHEN I manage to redo our kitchen!) is to move the outlets under the bottoms of the cupboards so they aren’t on the backsplash. we have so few appliances that we use the outlets for and I think it’ll be a much cleaner look. hi Christy! I’m not sure outlets at the bottom of cabinets IS A THING! it’s just an idea that I’ve had. the boxes will take up some space in the cupboard, so not sure how it’ll work. but it’s worth a shot! Loved looking at this post all over again. It’s absolutely gorgeous and now I’m looking forward to your landscaping project! Fantastic work! Thank you for posting the step-by-step. It may come in handy one day. You picked the perfect backsplash for your kitchen. Beautiful! This was a very interesting post. Thanks for sharing your methods with us. 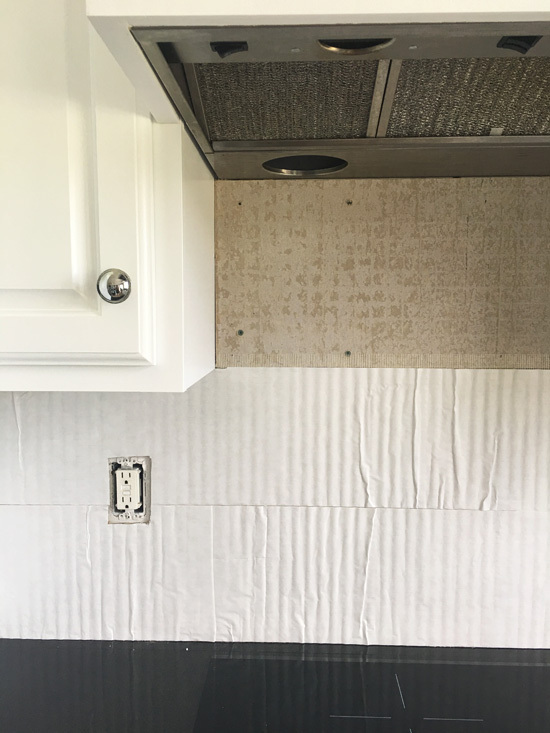 When we installed a new backsplash in our laundry room, we used the same tile adhesive mat and grout, and it worked like a charm. Makes the job quite easy, and it has held up well so far. 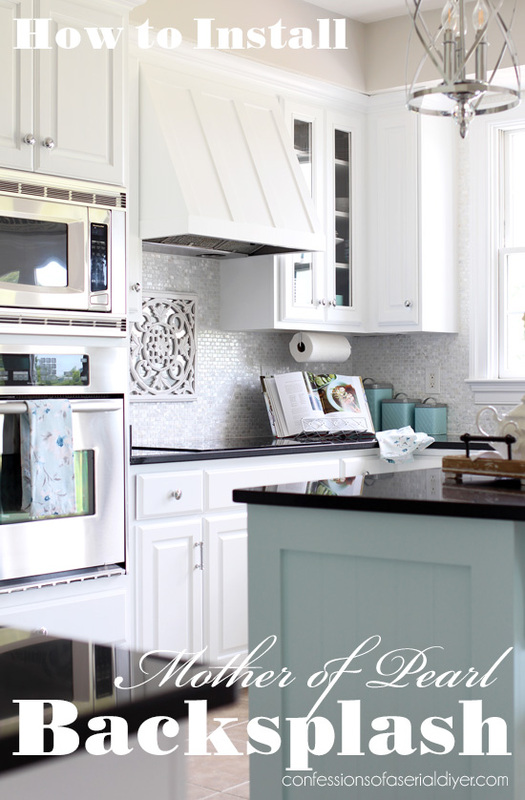 I really am loving the shimmery mother of pearl in your kitchen. I have really enjoyed reading about your kitchen renovation, and this one was perfectly timed since I am about to do a kitchen backsplash. Yours is just beautiful! 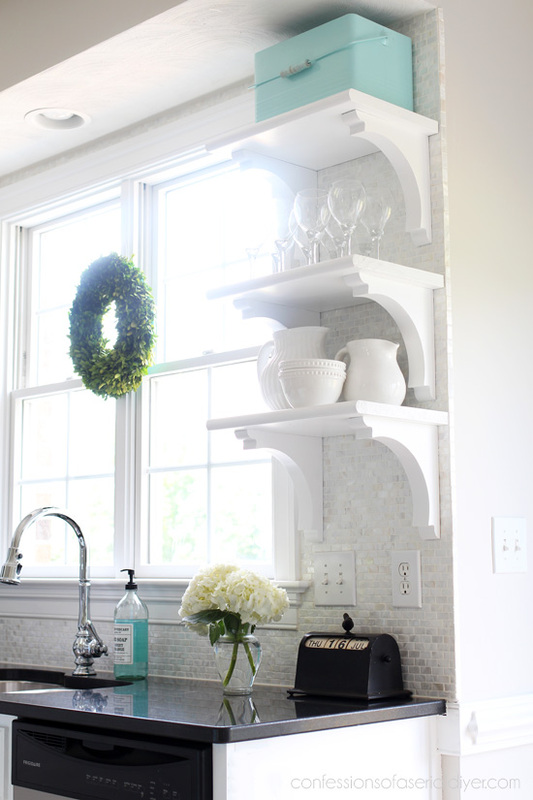 I do have a question though – – I love the open shelves that you have in your kitchen. Did I miss the segment where you told how you attached them? 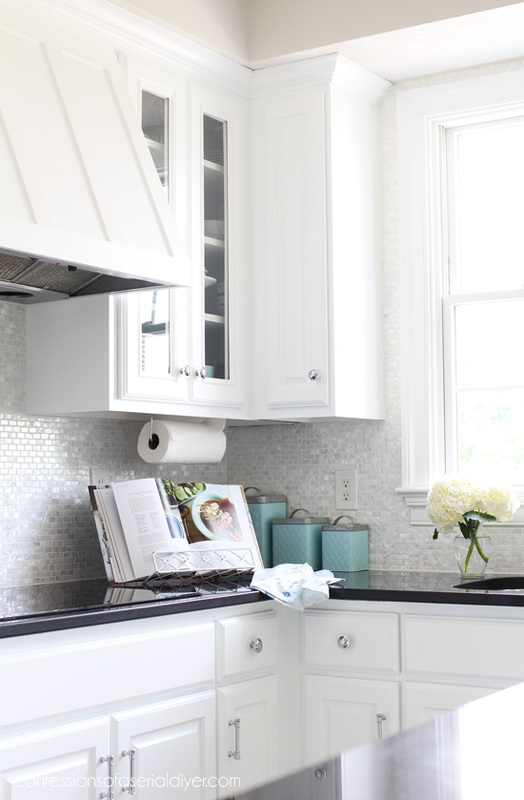 Did you attach your shelves first and then tile around them, or did you tile the backsplash first and then put the open shelves on top? You have done such a beautiful job! Another win! This is absolutely beautiful from top to bottom. It just brings everything together and is just the right amount of bling! With the bonus of really easy to follow instructions. WOW!!!!! 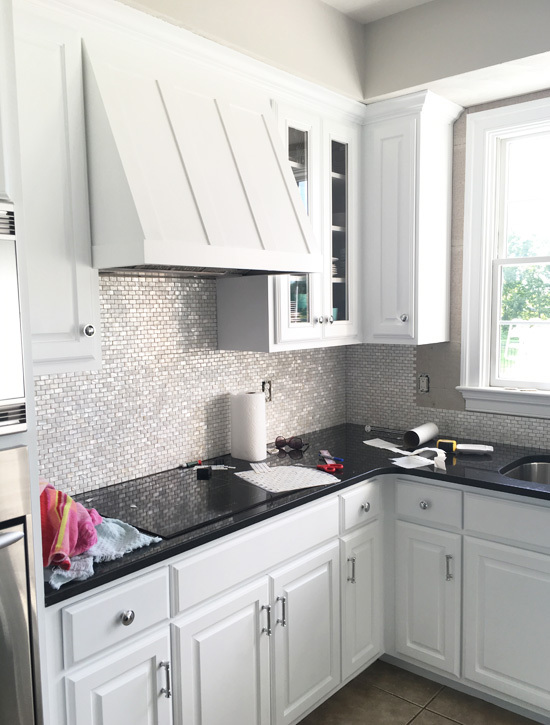 Your backsplash turned out absolutely gorgeous! 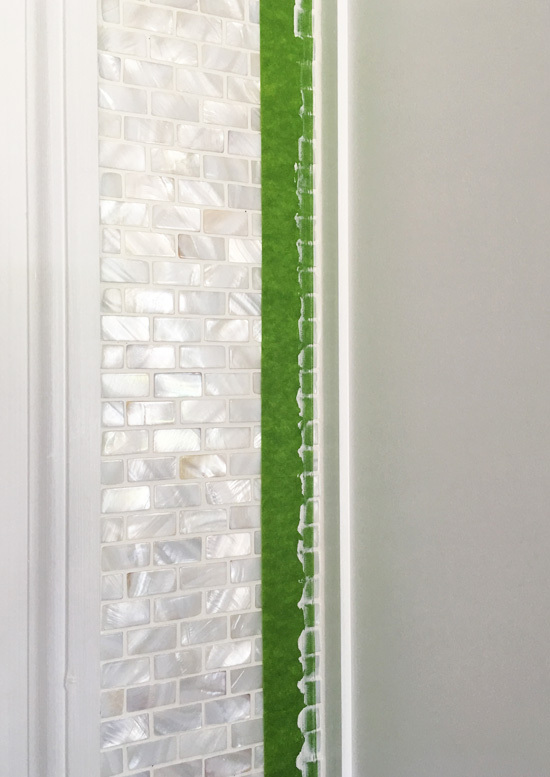 I love mother of pearl, too, and am so glad to read about the new adhesive roll method of sticking the tile to the wall. I have seen it in stores for a couple of years, but hadn’t seen or heard of anyone actually using it yet. Thank you for your post. 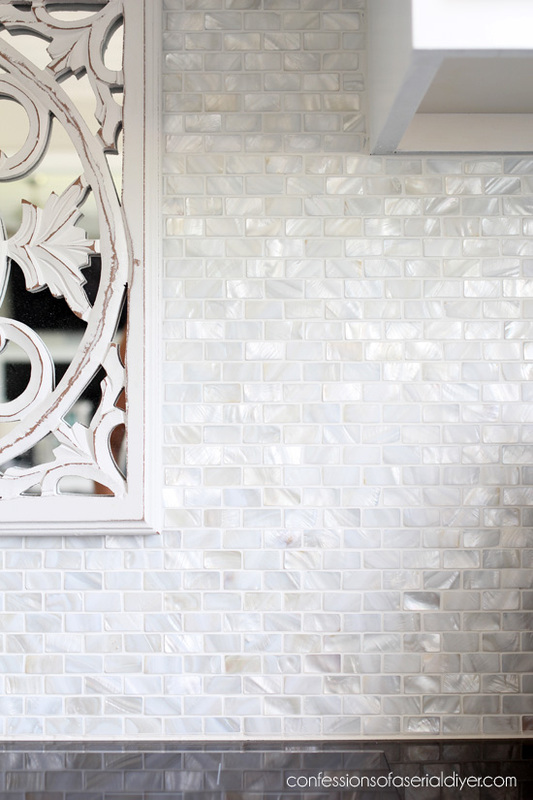 I’m definitely going to incorporate some form of shell backsplash in my next home! **Sigh** I have no words….stunning! 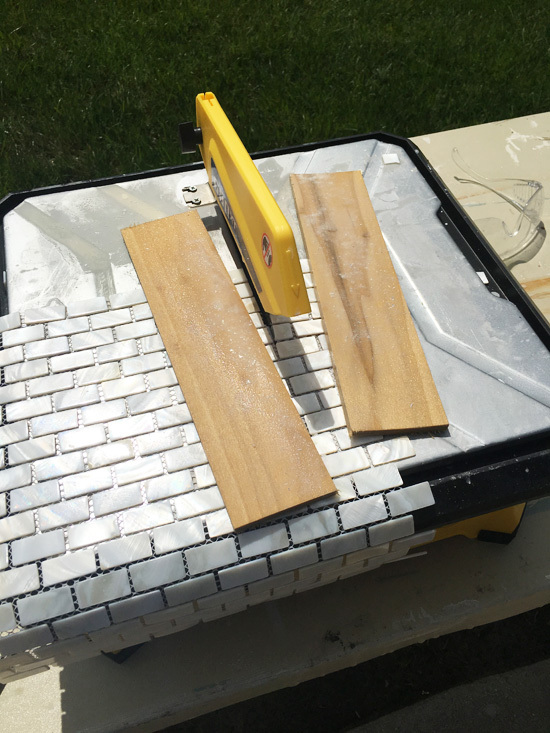 You make it look so easy,was always afraid of tile……well I have a large wooden tray in need of a makeover going to try it thanks for great break down. Who knows might lead to larger projects. So impressed with your entire kitchen. Beautiful. Wondered if you were able to move the sheets of tile once they were put on the mat? Nice job! 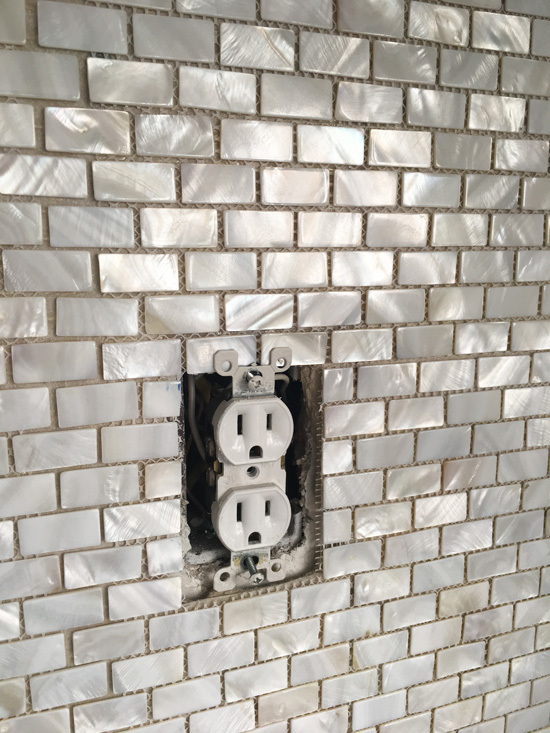 One question remains with my husband asking:..How were you able to cut the tile where the electrical outlets are? Any way it is amazingly beautiful! That Frog Tape sure makes getting a straight line easy! Gotta love it! Your kitchen looks fantastic! Looks beautiful! 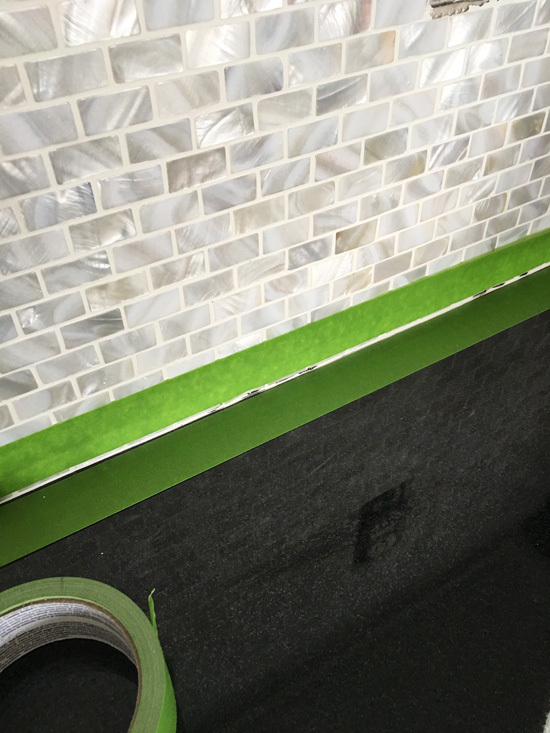 You mention that you removed the 4” granite backslash. Have you previously posted about how you did that and how the countertop looked underneath the removed piece? Thanks, Alicia! I did not post about it on its own, but did mention it in a previous post. I had a hard time removing the piece that was against the cabinet that houses the oven, so I used a heat gun to help melt the adhesive and then pried it off with a pry bar. 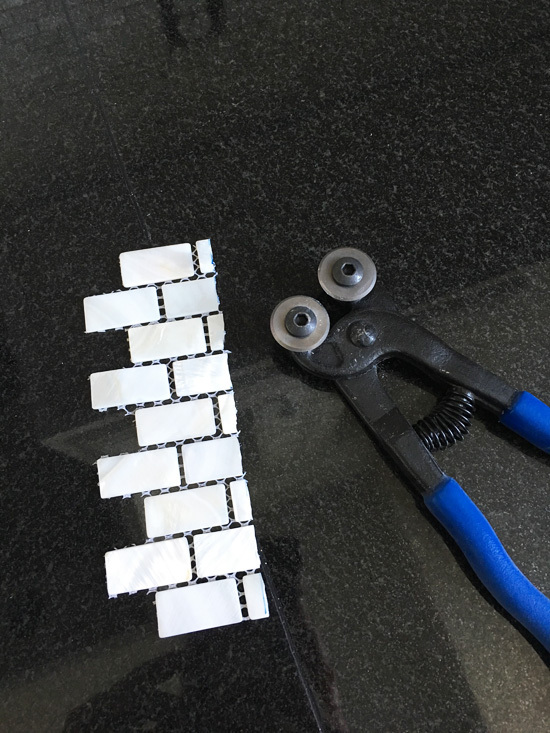 The rest of the granite backsplash that was attached to the wall came off quite easily with just a little bit of prying with the pry bar. 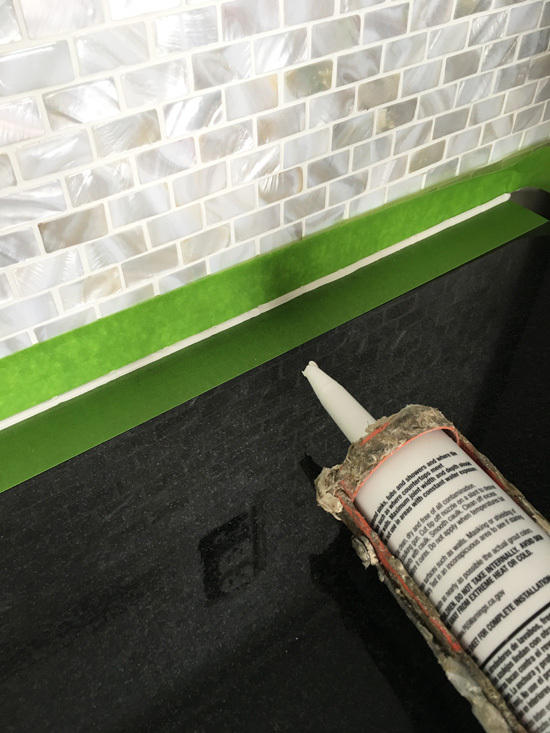 The counter looked perfect underneath except there was a silicone caulk strip that I had to remove. I used a straight razor blade to scrape it right off really easily and that was it! Unfortunately the counter under the piece that was next to the oven had a piece cut out of it that was covered by the backsplash, but too big not to recover when we were done, so we added that one granite piece back. Sooooo AWESOME!! It looks absolutely fabulous!! You are a true inspiration to women – you demonstrate that we can do anything men can do – I’m so impressed with your skills that I may just try to tile something in my own house. Thank you so much for the best tutorial I’ve ever seen online (or even at Home Depot) You have a true gift for teaching. The whole kitchen is gorgeous! 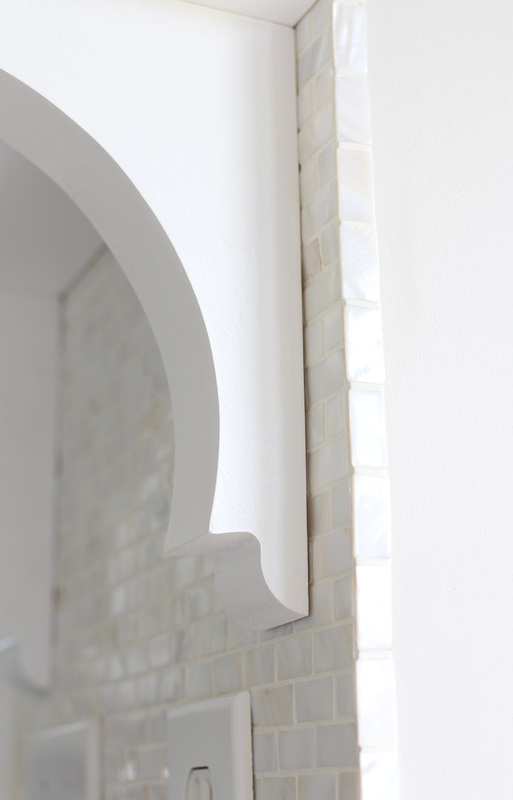 Love the tip about caulking…perfect line. Fantastic! I like the way your tile choice is still white and able to be decorated with a new look anytime you want, but unique, not just plain. It has sparkle! Nice tutorial here! Hi Christy. I love the way your kitchen is turning out it looks gorgeous! What type of tile did you use (like the brand) and where did you purchase it from? I’m loving the color/look, and I’m actually getting ready to redo my countertops and backsplash. I’d love to hear before I get started! It’s beautiful!!! Great job, but what did you do about the wrinkles in the Mat?? Would they make the tile stick out or did you flatten them somehow?? Like yourself we had a four inches (of 6 x 6 beige) backsplash the we had taken out when replacing our same countertop with quartzite. stunning, but not sure if ‘real life’ holds the same status). experience the same, or did the backboard take care of that issue if you did? Sorry for all the questions. Your Kitchen looks STUNNING! Gosh thank you for the speedy, and detailed, response back Christy! I did order two different colored samples a couple of weeks ago. One is identical to yours and the other one is much lighter (it’s the grout less MOP). It’s very difficult to tell how the full space will look with just two 1/3 samples. 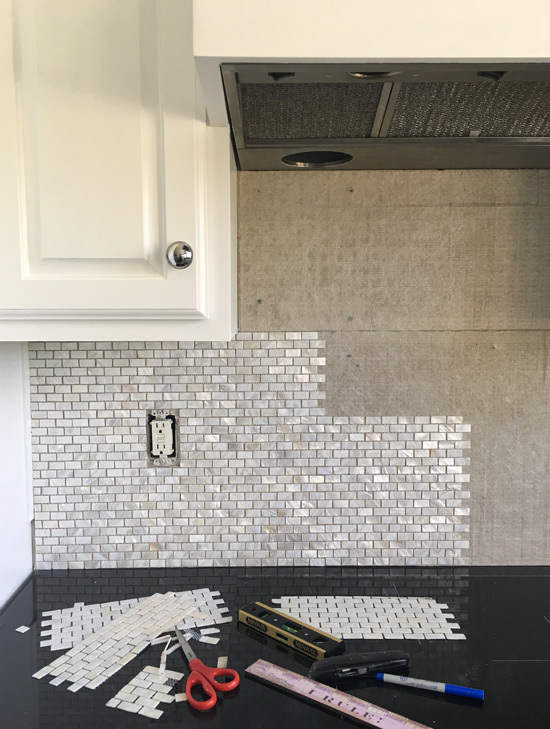 I, personally, prefer the grout less (whiter/lighter colored), and hubby prefers the same one you have installed in your kitchen. We are also looking to do the same as you have with the under cabinet hood. 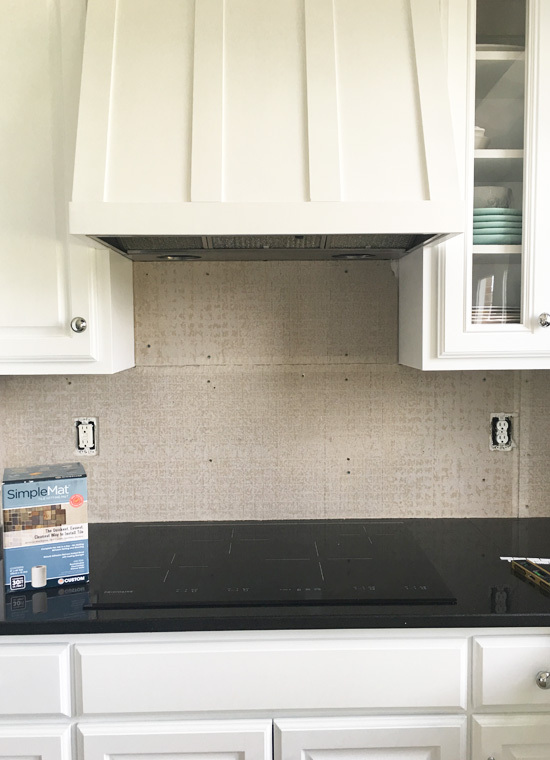 We took out our over the range microwave a couple of months back and have been searching for a slim under cabinet hood, with lights and control buttons underneath, so we can build a wood hood for and have been having a difficult time finding the right one! Thank you again for the response. Your designs are fabulous!